Sally Hales reviews Steven Dietz’s “Beautifully observed” portrayal of the aftermath of the Vietnam War. Last of the Boys at Southwark Playhouse. Photo: Ben Broomfield. Any play that draws a symbolic parallel between the Rolling Stones and the Vietnam War has got to be good with me and prolific American playwright Steven Dietz’s Last of the Boys does just this, rather unsubtly it has to be said, via a sign with ‘Just Stop’ painted on it. John Haidar directs the European premiere of the 1990s-set play 10 years after it was first performed stateside. His reasons for doing so in a US election year are clear; the play is rich ground on which to pick over the politics of the world’s greatest industrial-military superpower. Dietz lays claim to being the most-performed playwright in the US, mainly in regional theatres, and it’s not hard to see why he’s so appealing there. Beautifully observed, Last of the Boys delicately grafts great big themes onto a spiky-yet-ordinary relationship drama – here everyday life oozes with ghosts of the past, both political and painfully personal. Vietnam veteran Ben (Demetri Goritsas), the last resident of a toxic trailer-park, is visited by his oldest friend, a service colleague and old hippie Jeeter (Todd Boyce), shortly after the funeral of the former’s estranged father. Ben is a believer. He idolises Vietnam War orchestrator Robert S. McNamara, who despite privately believing the war was futile as far back as 1965, said nothing publicly and allowed the war to drag so painfully on. Parked with his caravan, Ben is literally and metaphorically the last standing. In contrast, his old friend Jeeter, is a small-time professor who teaches ‘the 60s’ and follows the Stones – a band he adores – around the globe on an unending quest for them to see the message he has hand-painted on a sign: ‘Just stop’. If only McNamara had had the guts to go on such a quest or had such a loyal friend. As revelations and betrayal creeps into their 30-year friendship with the appearance of Jeeter’s young lover Sal and her mother, there is a delightfully subtle performance of emotional restraint from Goritsas as the singular Ben – a man who must believe he is on the side of right – as he and the more fluid Jeeter pick over corpses both real and metaphoric. This trailer-park realism is smashed with several sequences when Ben transforms into McNamara himself to converse with (the ghost of?) a young soldier and devotee, movingly played by Cavan Clarke. Goritsas does a convincing and compelling job of conveying these shifts with little more than a pair of glasses, but the sequences are driven home a little too hard with heavy-handed lighting and sound cues, threatening to topple them over into being just silly. And there are other problems. While Sal and her mother’s appearance spark emotional change, the characters are thinly drawn and Sal, tattooed head-to-toe with the names of the war dead, sinks entirely under her own symbolic weight. Her mother, Lorraine, is an alcoholic trailer-trash cliché who exists purely as a provocateur and is simply too stylised for her story to be moving. 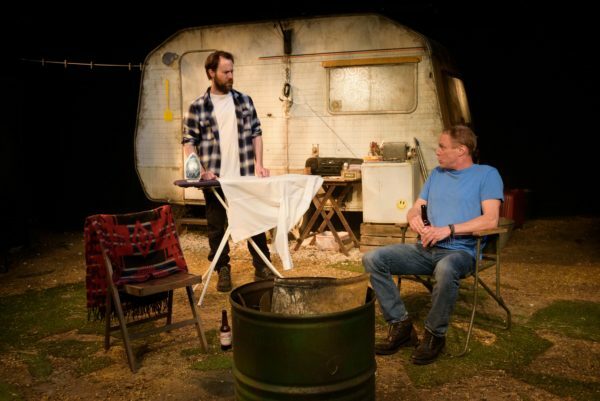 A play that deals so intimately with the personal costs of one particular war and one man’s culpability for it is a tough sell for those not brought up in the midst of its fall out and, as timely slice of American politics, Last of the Boys doesn’t quite land; its themes feel slightly on an axis to contemporary issues. Yet the play it is an evocative and intimate examination of how the ghosts of the past live and act among and upon us. Last of the Boys is on until 4th June 2016. Click here for tickets.